And they are ruled by King Thistle, ably assisted by Lords Kudzu and Creeping Charlie. I am an intermittent gardener, at best. I can’t blame nurture. My mother grew fruits (raspberries, strawberries, etc.) and vegetables. Both my maternal grandfather and paternal grandmother had amazing flower gardens, specializing in roses. Grandpa also had a large selection of dahlias (some of them his own breeds). My husband has a vegetable garden in the backyard. I wanted flowers in the front. After several years of intense neglect, I decided to take another shot at making it look like more than a weed patch. My son suggested that I salt the earth and put in a rock garden. I began with a small patch in front of the house. I had to dig out all the weeds by hand (actually shovel). So far, so good. Turn over the dirt; rake out the weeds (and many years of rotting leaves). Hmm, what is that hard thing I keep trying to shovel? We have rocky soil, but this is ridiculous. Finally, I scraped away all of the detritus. Oooh, it’s the sidewalk! And there are things actually growing on it. How embarrassing. Oh well, in for a penny, in for a pound (guess that saying survived from Colonial times – otherwise, it makes no sense whatsoever). I trenched along the edge, swept away the dirt. Voila! It was all still there. So I shoveled along. Guess what? Myrtle grows on the sidewalk even better than weeds! I always thought nothing grew better than weeds. I moved on to a section full of lily-of-the-valley. I love them and wanted to move some of them to my newly discovered soil. 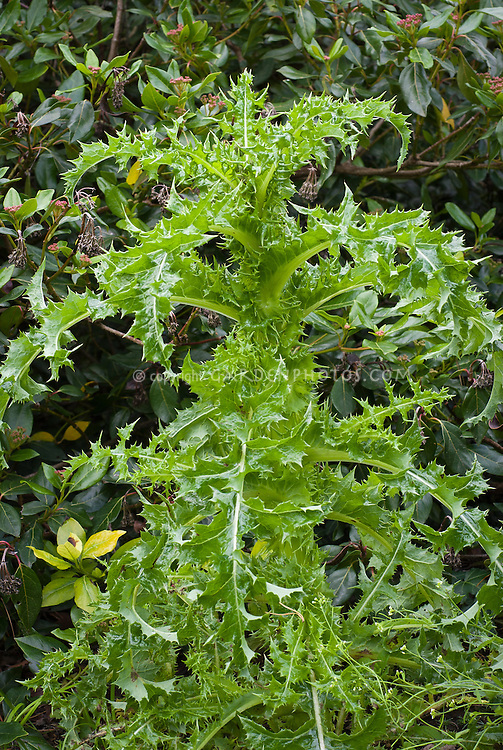 The only problem was that they were “protected” by some really healthy thistles. I’m told that thistles grow in abundance on the moors. I’m going to look into a repatriation program for the ones in my yard. I don’t believe in herbicides, but the thistles were three feet high. I bought the least toxic type. It didn’t kill the thistle. My husband pulled them out for me (root and all). I threw away the Round Up. I bought some blue spruce sedum to plant along the path to the garage. It’s been really dry and the ground has never been used for anything except scrub grass. (You didn’t expect Kentucky Blue, did you?) My husband used the tiller, and they went in with no real problems. They like dry soil, so all is well. The house is on a small hill. It’s almost impossible to mow, so I decided to put in moss (easy to grow, spreads well). My husband offered to till it for me. For logistical reasons, I decided to start at the top, just past the sedum. He had just started to till when he heard a crunch. He’d cut a copper pipe to something. It would have to be fixed before he could root up any more weeds. My moss was in its nursery containers looking a little unhappy, and my husband and son were leaving on their annual fishing trip. So back to the shovel. In dirt that had seen no cultivation in the fifty years since they moved the house from its original site on a farm. Oh goody. I finally had enough space for my 12 moss plants. I dug the holes. Hmmm. I bet the soil in Ireland doesn’t look like clay that’s ready to be fired. The lady at the nursery said to mix sphagnum peat moss with the soil to loosen it for the plants. I had a bag. I needed a bog. So I planted them directly into the sphagnum. I used her extra-special root food and hoped for the best. It’s been a couple of weeks and they haven’t died. Maybe I should play them some Celtic folk music. I wonder how much the salt and rocks would have cost?